We’ve got good news! Black Top Racing has granted the Better Automotive Lighting subscribers a special discount to use on anything in the store right now! USE COUPON CODE C8A29BFC0A30629 FOR 5% OFF ANYTHING IN THE STORE! That’s right, if you need LED Light Bars, LED Headlight bulbs, Sealed Beam headlight housings, LED Fog Lights, or HID Conversion Kits, you can get a good deal right now! No waiting, save money today! Use the coupon code above and save money on your next Pontiac Fiero Lighting Upgrade! Looking for a review on Headlight Revolution. Headlight Revolution is awesome! Has anyone done business with Headlight Revolution? Is Headlight Revolution a Reputable Company? These questions get asked all the time and you can see below that many people have had great success with Headlight Revolution. You can find more real reviews by real people HERE. Click here for a Headlight Revolution coupon code. Easy installation, better lighting & great appearance.Would deal with again because the lights are high quality. Vision X Review: Big improvement over standard headlights; look great with halo option. If you can afford it, I suggest getting the option that allows the low and high beam to operate at the same time because it makes a huge difference. Wish I would have done this. If you have a GM medium duty this is for you. Now like “day and night” with my C4500 pulling my 17,000 lb 5tj wheel. Worth every penny because of how bright they are. They are great! Love them! They are much brighter then the factory bulbs. Keep up the good work. They are expensive, but certainly worth it because they look amazing. I would by them again. I also appreciate the YouTube videos. Thanks again. A must have for the Hard Rock bumper because it makes install easy. No instructions came with brackets, but a picture online cleared any installation questions. Easy to put on. Great product! The 1984-1986 Chevy Corvette C4 came from the factory with that old-style sealed beam / halogen headlight housing. You can’t take apart the headlight and just swap out a new bulb – it’s a sealed unit which means it’s required to replace the entire assembly. A lot of people install aftermarket “composite” style 5×7″ rectangular headlight housings that allow you to install aftermarket replaceable bulbs and then people will do an HID conversion kit for more light output. But this isn’t a great option for the C4 Vette because the way the pop-up headlights work: The housing buckets actually flip all the way around, like a 180 degree spin! All of the wiring and harnesses coming off of the HID system to make it function get in the way of the pop-up mechanism and it becomes difficult to do the install. It’s possible, but there’s a LOT of wiring involved. The C4 Corvette uses an H6054 glass/halogen sealed beam headlight housing in a flip-up assembly. The best upgrade for the C4 Corvette is the JW Speaker 8900 LED headlight housing replacement. It will provide nearly 3 times more light output, plus a wider, brighter, and whiter beam pattern. Because HID conversion kits are so bulky and difficult to install, your best bet is to go with a full LED housing replacement like the JW Speaker 8900. This headlight is a standard size 5×7″ sealed beam replacement housing and it’s 100% plug and play on the Chevy Corvette. They come with a 5 year warranty, and just like your Vette they are made in America! Popular in the heavy duty trucking market, the Model 8900 Evolution is a simple drop-in replacement for 5″ x 7″ headlights. They feature a tough die-cast aluminum housing and hardcoated polycarbonate lens for maximum durability. The high quality LEDs and engineered optics produce a superior beam pattern for maximum visibility. Install it in your vehicle to see just how impressive the best LED lighting can be. What does OEM HID Mean? When you are looking at options for upgrading or replacing the headlight bulbs in your car or truck sometimes they will ask you if you have “OEM HID Headlights“. If you don’t know what that means, then keep reading! If you DO know what that means… you still might learn something! OEM means Original Equipment Manufacturer. This describes a manufacturing company that makes the parts for the bigger car manufacturers. If a vehicle was built by Chevrolet and came with HID headlights right off the assembly line, then this is an OEM component. They all mean the same thing: When your vehicle was new, this is the way it was built and outfitted by the original vehicle manufacturer. On the left blue 350z you can see the OEM HID headlight. On the right white 350z you can see the OEM halogen headlight. Same car but with two different headlight bulb style options from the factory. On the left you can see a typical style of OEM HID bulb (D1S) and on the right you can see a typical style of OEM Halogen bulb (9005). How do you know if you have “OEM HID” Headlights? -The dealer can look up your vehicle and tell you what options are installed just by reading the VIN in their computer system. What is an HID Conversion Kit? If your vehicle DOES NOT come with OEM HID headlights you can do a conversion from halogen to HID by using an HID Conversion Kit. On the left you can see the aftermarket HID bulb for an HID conversion Kit. On the right you can see the OEM halogen bulb that is being upgrade to HID. This is what a typical HID conversion kit contents look like. The kit comes with 2 aftermarket HID ballasts, 2 aftermarket HID bulbs, and 2 plug and play wire harness adapters. Make sure you get a good quality HID kit like this one from GTR Lighting otherwise look forward to a lifetime of problems due to low quality parts. Everybody has probably seen a Montgomery Ward 3 wheeler, but had no idea it was called a T555 (pronounced Tee Five Fifty Five) and also nicknamed the Trail Master. These things can be found at any antique show, your grandpa’s shed buried under old blankets and sawdust, or on your parent’s home videos from the 70’s. These were produced by Montgomery Ward in Omaha, Nebraska in the early 1970’s and were all built by hand. Only a few are left in operation today and from time to time you can find one that was restored and able to be ridden today. This is what most of these 3 wheeled death traps look like nowadays. I got a hold of one of these things, found in an older gentleman’s garage – hadn’t been touched in decades, and I fell in love with it! There was just something about the American nostalgia about it, and the cool shape and design, knowing it was hand-built 40 years ago by Montgomery Ward, I just had to have it – and I had to fix it up! Like most vehicles that I own I can’t just leave them stock, I had to customize it and make it mine. We started with the frame: Moved the seat back 5 inches, and removed the flange in the middle of the frame in front of the seat. We had the whole thing powdercoated a metallic black, and the front fender and foot-wells were coated in Line-x bed coating for durability. The wheels were also taken apart and powdercoated silver to match some other components on the engine. Next we had a new seat made out of waterproof vinyl by a local upholstery shop, took the engine apart, powdercoated the cover panels and ordered a bunch of new drivetrain parts. We got all new bearings, new brakes (custom made lines), new twist-throttle handlebar grips, a new brake handle, built a custom battery box for a Vision X battery and built a wildly custom intake an exhaust using a K&N filter, and a custom mini-bike style exhaust muffler. Everything got the presidential treatment! 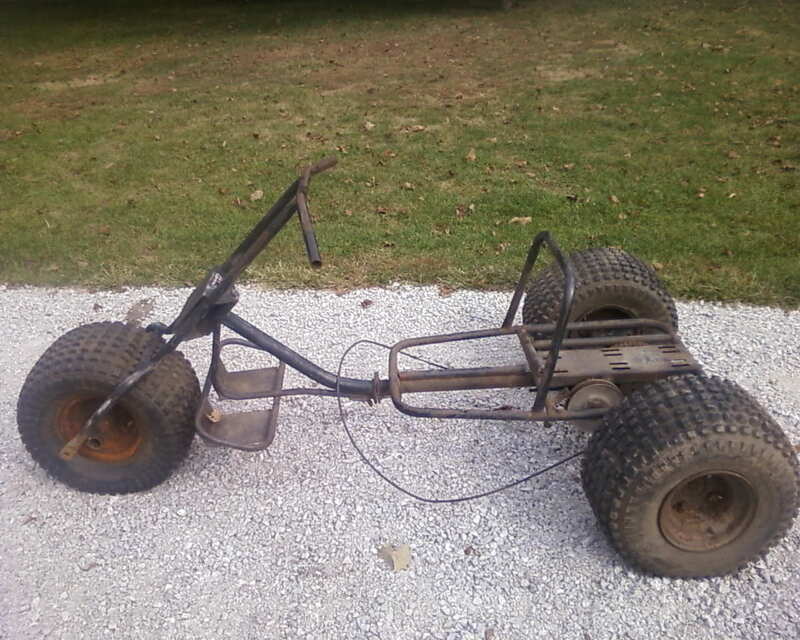 No expense was spared, and the whole project probably cost me about $5K with buying the trike, new parts, powdercoating, custom fabricating, and other labor. Here you can see the custom hand built exhaust using a mini-bike muffler, attached with the stock exhaust brackets and mounting points. It’s very loud. In order to run the new lighting that was added we needed a battery, so we used the Vision X XPC-220 and made a custom battery mount to hold it in place. Up front we have a Bubba Rope recovery rope, and on the rear we have a custom-mounted Monster Hooks brand heavy duty swivel hook. Here you can see the custom pull cord handle made out of aluminum and powdercoated black. This handle came from Tricked Toys, and to mount it on the trike without having it rattle around we made custom mounting points for it. On the rear of the trike we also added red LED running lights, a Monster Hook, a custom billet pull cord handle, and a Vision X battery in a custom battery box. The engine features a custom made, hand built exhaust and intake using a fully adjustable carb. We actually found an updated engine from a 1980’s snowblower to use instead of the original one, but it was still the Tecumseh HM80 used to power this American Made beast! The reason for going with the newer engine was not that the original was worn out, but the new one had less antiquated electronics controlling the ignition and came with a built in electric-start for use with a 110v extension cord! We thought about upgrading to a 10hp engine, but thought we should at least keep the engine original-ish. On the front of the T555 trike we did all kinds of stuff there too. We found some motorcycle handlebar grips that had a really cool Harley/hot rod look to them, pointed on the ends, and an integrated twist-style throttle. Also, we tossed the original two-handle brake levers and installed a brand new single lever brake handle, with all new brake pads, and all new cables which had to be custom made. Also mounted on the handle bar is a Vision X LED Light bar and a dirt-bike style ignition kill switch. The original headlight on this thing was a 4.5″ round halogen incandescent lamp that was actually routed through the wiring as part of the ignition circuit. We pulled it off and installed a direct replacement (same brand as the original also) JW Speaker brand 6045 LED headlight. JW Speaker still even had the rubber retaining rings in stock to hold it in place so we were even able to use the stock headlight bucket. The new LED offroad light and LED headlight are INSANELY BRIGHT. The headlight alone is at least 10 times brighter than the original. The front end shot here you can see the custom handlebars, custom brake handle, the new LED headlight and the new LED offroad light bar. We added an LED offroad light bar from Vision X and let me tell you, this thing is insanely bright! The original headlight used was from JW Speaker (made in Wisconsin) and it was a 4.5″ Round PAR36 halogen lamp. This is the new replacement model also made by JW Speaker, called the model 6045. It was a direct drop-in replacement for the original! We had the frame totally torn down and powdercoated a metallic black color, and the foot pedals coated in truck-bed lining for extra durability. Also we contracted Lone Mountain Innovations in Idaho to make a customized Molle frame saddle. This way we won’t lose our wallet or phone! 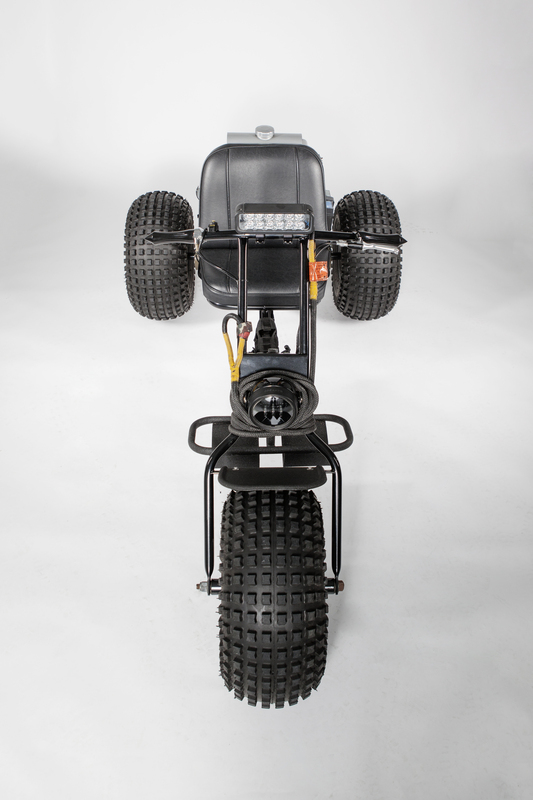 This top view gives you a good idea of the shape and stature of this beastly 3 wheeler! On the back you can see where most of the custom work was done: Gas tank, battery, exhaust, intake, adjustable carb, lots of powdercoating, custom tow hook, and red LED driving lights from GTR Lighting. The finishing touches on this trike was a set of red LED driving lights mounted to the rear of the truck, activated on the same circuit as the headlight. We used a pair of GTR Lighting 7″ long LED Lightning strips because they are super low profile (don’t really even notice them when off), and they are waterproof, and insanely bright!